Heat stroke is by far the most common summertime danger for our pets but there are a few other things you should be aware of during the warm months. Another cookout troublemaker is corn on the cob as it is the perfect size to be scarfed down whole and then lodge in the small intestine. This then causes an obstruction that almost always requires surgical intervention for removal. Signs to watch for are decreased or loss of appetite, lethargy, vomiting, diarrhea or abdominal pain. If your dog displays any of these clinical signs please bring him to your veterinarian immediately. Other dangerous food items are onions, garlic, grapes, raisins, chocolate and sugar-free gum. If you think your dog may have snacked on any of these items either see your veterinarian or call ASPCA’s animal poison control 24-hour hotline. If you are going to have guests staying with you this summer and you have a nosey dog or cat be sure to tell them so they can put away any medications they may be taking. Even over the counter drugs such as Tylenol, Advil, Aleve and Sudafed can be life threatening to pets. If you notice most of what I have been talking about is directed towards dogs. It is not that I have been neglecting cats but as a general rule they are usually smart enough to avoid most of these issues. You rarely see a cat running around outside in 90 degree weather or jumping up on the picnic table to grab an ear of corn. The one lapse in judgment that almost all cats suffer from is their determination to eat plants and flowers. Many indoor and outdoor plants and flowers are extremely toxic to cats and dogs causing clinical signs that range from stomach upset to death. 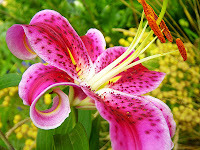 The most infamous flower is the Lilly. Kitties only need to eat a small bit of petal or leaf to cause acute kidney failure, which quickly leads to death. The ASPCA website has a comprehensive list of plants that you need to watch out for. Finally, fireworks and thunderstorms can be a source of fear for your pets. If you notice that your dog or cat does not seem to appreciate the loud noises be sure to take precautions so they don’t run away or destroy your home. Speak with your veterinarian about administering an anti-anxiety medication. Pure sedatives are not ideal and can actually make things worse as your pet is still afraid but too sedate to do anything about it. This then causes a rebound effect and the next time they experience feelings of anxiety it will be much worse. Also keep in mind during the warm weather fleas, ticks and mosquitoes are out in force. Be sure to administer your pet’s monthly heartworm, flea and tick preventatives. This goes for indoor kitties too, they are still at risk for heartworm disease. I hope these tips help you and your pets have a happy and safe summer. Very interesting advice regarding the various foods & OTC drugs which can be dangerous to a dog's system. Thank you! I will share this info with all my dog friends and family members.